Boat fishing in the relatively high water. 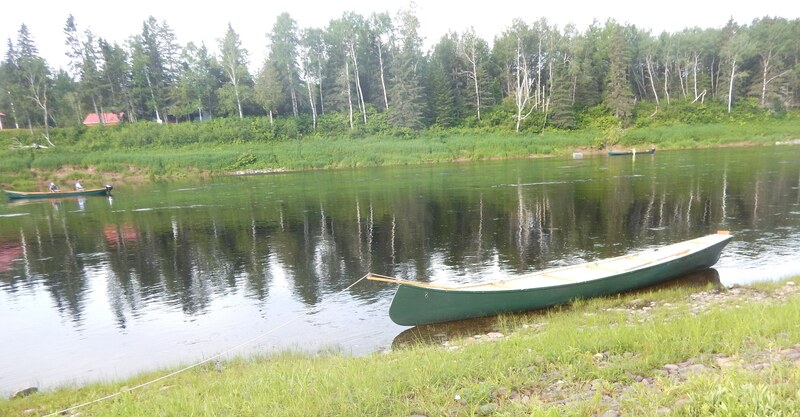 22′ Chestnut Ogilvie Fishing Canoe in the foreground. Darrell Warren prepares to net Tim Politis grilse. 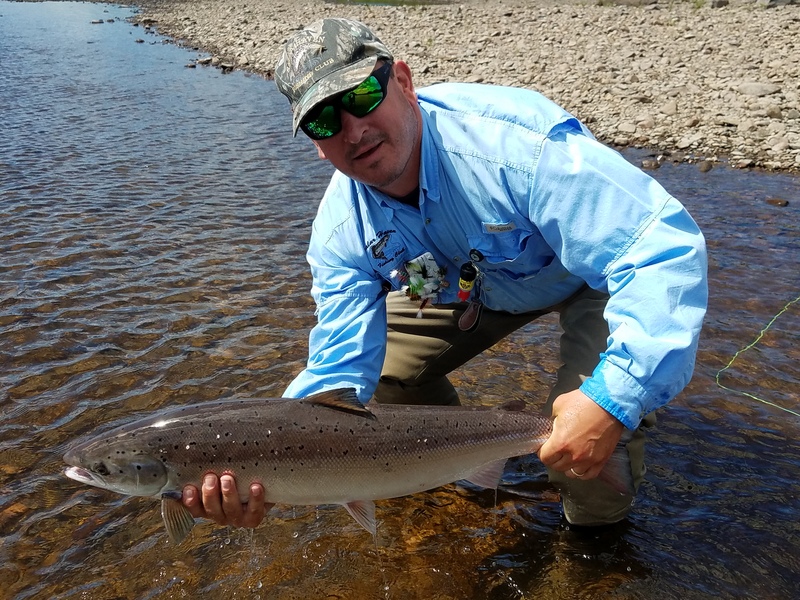 Fishing Friends – this past week on the Miramichi the run was still very sparse, but it did show signs of starting to pick up with the early arrival of some pods of grilse. Three of us fishing for three days netted two fish – one a grilse and the other a salmon of about 12 pounds. Tim Politis caught them both. The grilse came on a Red Francis, and the salmon on a #6 dark bucktail pattern with a black body, gold rib, and very slim blue throat. It seemed like a very sparse fly for a meter of rising water, but it was cast in front of an aggressive fish that moved 6 feet across the surface of the water to grab it! 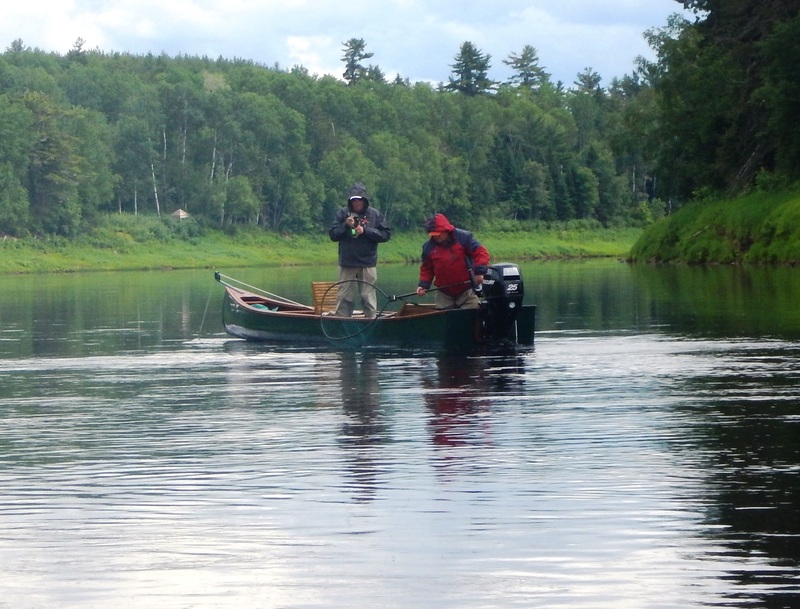 Jason Curtis and his angler were fishing in a canoe near his fellow guide Darrell Warren when Tim caught the grilse, and he got the jump on his phone. The fishing weather has been the best for June that we have seen in years with a continuing string of cool days, often with showers, that have kept the water up slightly higher than is optimum for good fishing, but healthy since we are now going into what is normally the warmest part of the summer. These low-normal temps are forecast to continue for the next couple of weeks, and with luck will coincide with the first big push of fish which can arrive anytime. We saw quite a few more parr this trip than we had been seeing, and they seemed well spread out throughout the pool as opposed to just along the shore. One evening I saw in some abundance the tiny splashes of feeding parr reflected in the low sunlight both up and down our bend in the river for a quarter mile or so in both directions. It was great to see. John Vickery with an Upper Blackville salmon. The DFO June 15 cumulative counts from the various barriers and traps are not yet posted for 2017, and as they seem to do every year they have changed the website address. I will post the new one to the information links page on my website. I was able to figure the numbers out to some degree, and they all appear to be at least as good or better than last year and other recent years. I guess you could say so far so good. It is far too early to draw any conclusions. What we see in the next two weeks will tell us much more about the strength of the 2017 run. With the fear that the outgoing smolt are being significantly depleted by striped bass all eyes will be on the returning grilse numbers. Speaking of stripers we caught one 8 inch fish a couple of weeks ago and nothing else since. Thanks for the update Brad. Doug – I remember in 2010 that I had my friend and very good angler Steve Bellefleur up at camp at the end of June and in a week we never got a fish – and saw only one or two. Steve left after another empty morning, and that afternoon I went out with Jason’s father Wayne. The run simply started and the pool was lousy with fish. 2010 was a great run too, though ruined by the heat. Statistically the end of the first week in July sees a huge jump in fish. Let’s hope it is the case this year. Hi Brad and Jason- Thanks for the great reports from your neck of the woods. About the same here in McNamee. We have had great sea-run trout fishing in June and got into a decent little run of June salmon two weeks ago. This week seen more grilse around , most were smaller than usual but still feisty and provided some great action. Unfortunately the Cains River Crown Reserve is disturbingly void of big trout this year, which has been the downward trend since about 2014. Keith – we also noticed that one of the grilse that we caught was somewhat undersized, though he was, as you say, plenty feisty. I just retired, and am hoping to extend my Miramichi fishing season by learning more about Cains sea run brook trout. Are you seeing plenty of trout, and not just the large ones, or are the sea run numbers down for all sizes? Way to go Tim! A Red Francis in June? – that’s sounds uncommon on the Miramichi. I guess you never know. Hope the action picks up as it typically does in early July.